Hornblower NY is proud to present our newest product: Broadway Cruises. 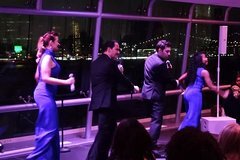 Drink, dine, and enjoy a live performance from your favorite show tunes as the NYC skyline passes you by. This is an exclusive pop up experience with select dates ONLY. Add a seasonal four-course meal, including delicious dessert, and after-dinner dancing for an unforgettable evening. The bright lights and big city awaits! Why make a choice between a Broadway show or a dinner cruise when you can do both! Drink, dine, and enjoy a live performance from your favorite show tunes as the NYC skyline passes you by. This is an exclusive pop-up experience available on limited dates. A must-do New York City experience! We love to combine the best this city has to offer into one incredible experience and there’s nothing more New York than seeing a Broadway show. But why settle for a just a Broadway show when you can experience all your favorite Broadway tunes live while watching the iconic sights and Manhattan skyline pass you by… and dinner is included! Hornblower New York’s Broadway Cruises are special pop-up events and perfect for group outings, celebrations, out-of-town guests and a completely unique way to experience the Big Apple and the best it has to offer. It’s the best Broadway Show in NYC!